They call it the Snow Slinger and it's the City of Copenhagen's bad boy for clearing the drifts of snow that form along the curb between the bike lanes and the streets. As mentioned before, the bicycle infrastructure enjoys the highest priority in Copenhagen. They are salted in advance of snowfall and they are cleared first when the snow falls. There are rules regarding snow clearance. The City takes care of the bicycle lanes and streets while home owners and businesses must keep their sidewalks clear. The latter are not allowed to shovel the snow onto the bicycle lanes/tracks. In cases of heavy snowfall they pile up the snow along the edge of the curb - as visible in the above photo, at right. When the snowploughs dedicated to the bicycle lanes remove snow they push it to the edge of the curb towards the street or into the gutter. The snow on the street is pushed towards the curb, but not onto the bicycle lanes. 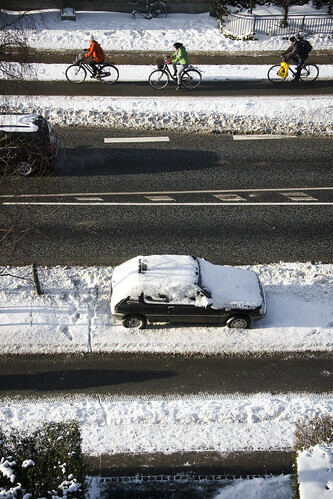 This photo, taken out of my window last week before the big dumps of snow, shows how the sidewalks, bike lanes and roads are cleared and where the snow ends up. The bike lane snowploughs carve a 1.5 metre path, which isn't the full width, but enough for overtaking. Anyway, the drifts from all the pushing snow out of the way are high in places and frozen solid to boot. Removing this snow is the task at the moment - although another snowstorm is expected to hit Copenhagen this afternoon with another 10-15 cm to add to the 25 cm on the ground. Here's a little film of the news report about The Snow Slinger on TV2's national news broadcast yesterday. Click on the the link for the piece about the Slinger in it's original form, in Danish. It's at 10:00 into the broadcast. I just added music to the above film. The Snow Slinger rolls along eating up the snow drifts and spitting the snow into a truck driving next to it. It can fill that truck in 5 minutes. After it's gone the bike lanes are free of the frozen drifts on the edges, making it easier and safer to cycle as well as to get in and out of your parked car. If you have one. Screengrab from TV2 Nyhederne.